With a construction budget of £700k, it’s no wonder this 1960’s bungalow has been completely refurbished into one of the most luxurious holiday escapes that we have seen. Described as ‘a 21st century twist on 60s Californian chic’ the team at The Manser Practice Architects +Designers begun this project with an initial brief to extend the existing ‘60s structure. However, that eventually changed to a complete rebuild for a five bedroom residence, complete with swimming pool, garage, self-contained flat, and stylish glass living room. 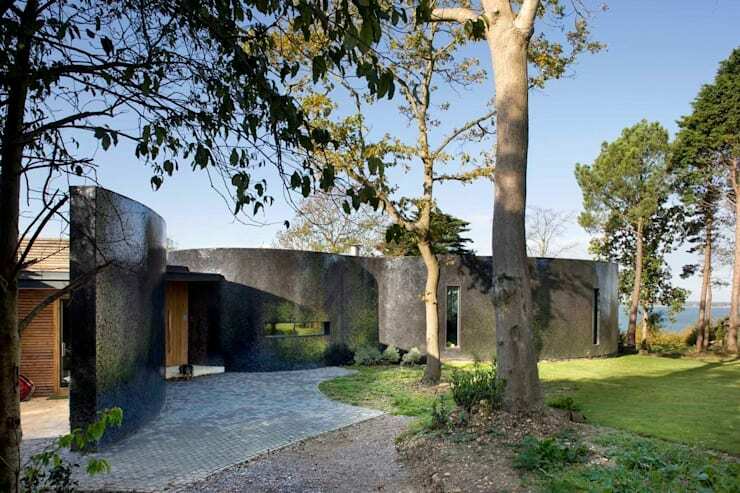 Maximising the sea view, the architects designed the new home to present as a mysterious black wall on approach, while the rest of the dwelling remains hidden behind and out of sight. Environmental sustainability was of the utmost importance, and in order to accommodate this request, ground source heat pumps, clay honeycomb building blocks, and high levels of insulation were used to increase the property’s green rating. Check out the unbelievably stylish images below, and journey through this beautiful residential refurbishment. On approach this home looks simply like a large black monolithic wall. It is bold, and unflinching in its daring design. Tiled with reflective mosaics, the wall is an audacious statement against its organic surroundings. However, it is what lies behind this wall structure that is truly striking. The five bedroom home, complete with pool, garage, and annexe is truly a spectacular delight. Ecologically friendly, and built using minimal and simple materials, the architects have created a home for the ages. Throughout the home, natural light is maximised. 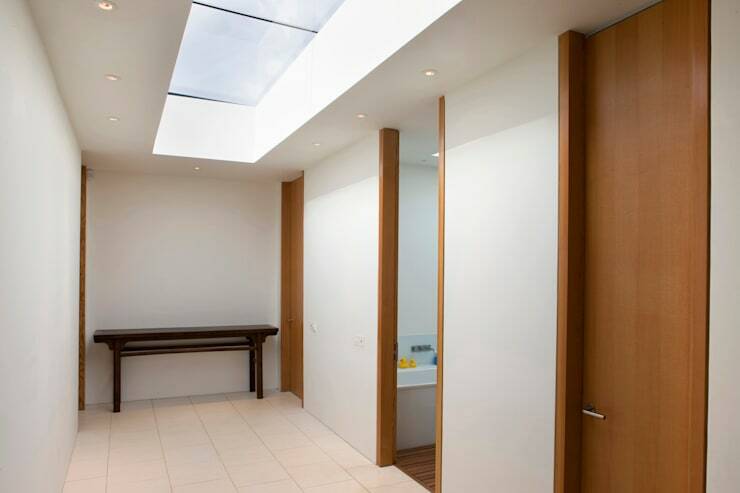 Here in the hallway leading to the bedrooms, a huge roof light has been installed, opening up the compact space, and working in conjunction with the downlights to ensure the corridor is simple yet friendly. The white colour scheme is contrasted with floor to ceiling timber veneer doors and frames, which create interest within the neutral space. The most impressive space within the home, the room is named the ‘glass room’ for obvious reasons. This area is spectacularly contained within floor to ceiling glass, maximising the view beyond, and creating a space that is unbelievably opulent. The central fireplace warms the area, and creates a central gathering point for the family to come together and socialise. There is also another private sitting area, located by the front door, if isolation and solitude is required. The polished timber floorboards are dark in colour, and match wonderfully against the white unadorned ceiling, creating a yin and yang effect. 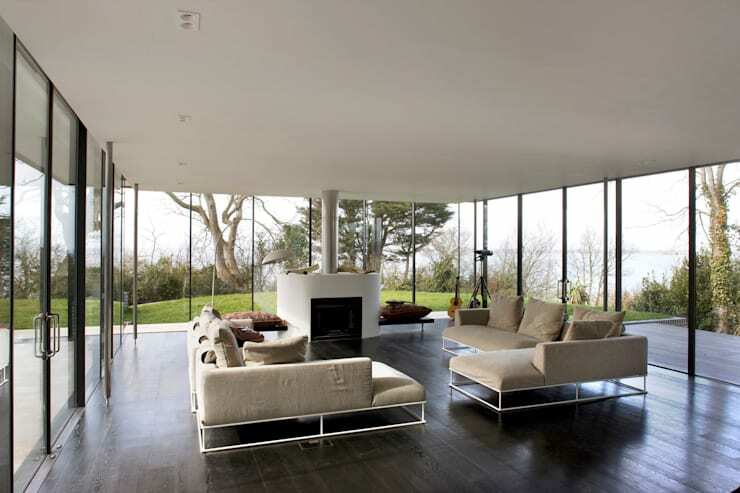 Outside, the living area can be seen through the glass walls of the home. There are split level terraces that fit the topography of the landscape and provide plentiful space to enjoy the stunning landscape and surrounding environment. A mixture of different textures and building materials have been used for the exterior façade and landscaping. Dark bricks, timber cladding, and teak decking are naturally cohesive with the striking backdrop of the Isle of Wight. 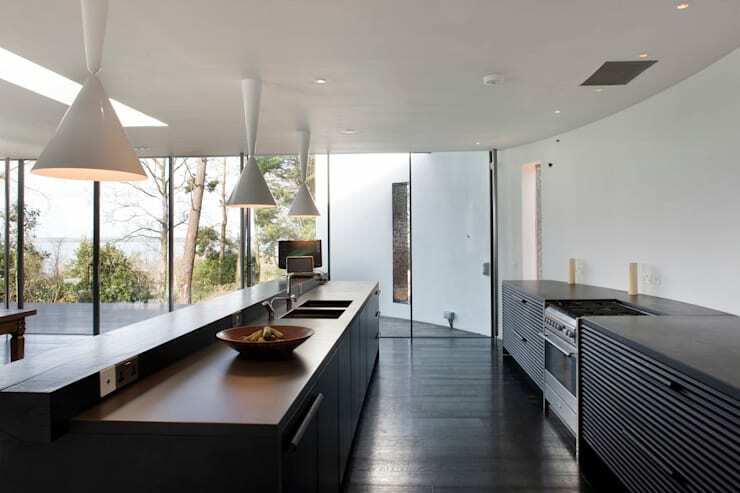 The kitchen is extremely contemporary and injects a sense of minimalism into the space. 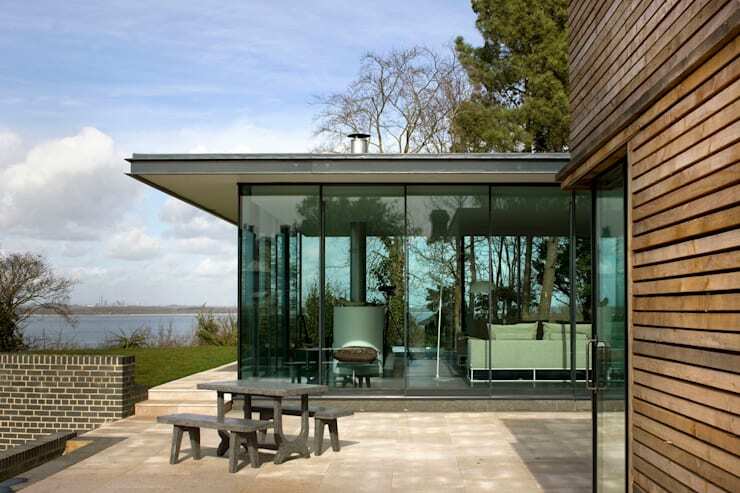 The joinery is all bespoke, and adds a clean depth to the glass room of this property. Statement light fittings hang over the floating kitchen island, and again inject individuality into this unique home. To add a sense of rustic chic style, the island also boasts a solid piece of timber, creating a space to lean, relax, and rest, while dinner is being prepared in the kitchen. The attention-to-detail within this property is wonderful. From the minimal bespoke kitchen, to the mosaic tiled façade, the home is replete with countless stylish fittings and fixtures. One of particular note, is the glass floor to ceiling sliding doors, which open up to the teak deck beyond, and allow a true sense of connectivity with the outdoors. Perfect for entertaining, this home is large, bold, and lavishly appointed. homify 360º: A monochrome marvel. Where is your favourite seaside destination? Let us know in the comments below!